The PRC Philippines released the much awaited results of Licensure Examination for Teachers (LET) - Secondary level August 2014. The list of successful examinees for Secondary was posted here. The Secondary Level of licensure exam for Teachers was expected to have more than 45,000 examinees this August 2014.. According to PRC, the teachers board exam was successfully conducted on August 17 in all designated testing centers nationwide. Licensure for Teachers (August 2014) was held in the cities of Manila, Bacolod, Catanduanes, Masbate City, Catarman, Batanes, Occidental Mindoro, Bongao, Tawi-tawi, Romblon, Puerto Princesa, Palawan, Zamboanga, Jolo, Sulu, Laoag, Ilocos Norte, Rosales, Pangasinan, and Hong Kong. 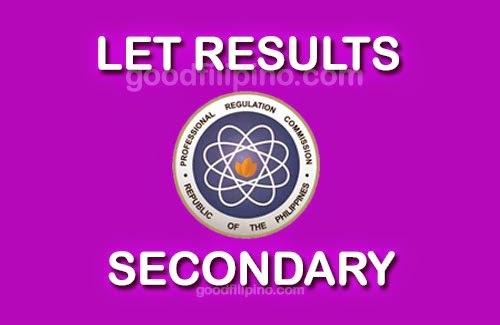 You may save/bookmark this page now because the LET results for Secondary Level is expected to be released this week. For more information about the LET Results (August 2014) - Secondary Level, please kindly share to your joined social networking sites. Comments or suggestions about "LET Results August 2014 - LET Secondary Passers August 2014" is important to us, you may share it by using the comment box below.